From the late 17th century until about the first quarter of the 20th, Çanakkale (whose name may be translated as "Pottery castle") was a ceramics manufacturing center in which were produced works that are distinctive for their originality of form. A rough red clay was used in pottery making though a beige-colored clay is encountered on rare occasions. Large, shallow dishes and jars make an appearance in Çanakkale's output in the late 17th and early 18th centuries. These are of higher quality and more successfully executed than those made a later date. Designs are painted in purplish brown, orange, yellow, dark blue, and white under green, brown, oxide-yellow, and colorless glazes. Large plates are decorated with cross-hatching in the rims and with centrally-located rosette flowers; dishes are decorated with galleons, mortars, mosques, and dwellings as well with animal figures such as fish and birds. Most decorations appear to have been painted on freehand. 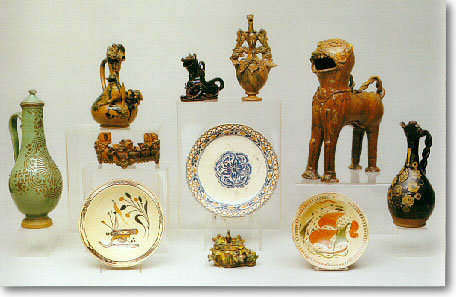 In works that can be dated to the 19th and early 20th centuries, there is a surprising and delightful variety of forms including jars of various sizes, jugs, pitchers, ewers, dishes, vases, writing-sets, braziers, candy-dishes in the shape of human or animal figures, gas-lamps shaped like ships, and animal-shaped jugs. In addition to ewers with braided handles and lipped or beaked spouts, we also find unusual examples with ring-shaped bodies and others decorated with horse-heads. Glazes are monochrome (green, yellow, brown, and purple) though late-period examples of wares with marbleized glazes are encountered. Monochrome-glazed wares tend to be decorated with stylized flower and leaf motifs painted onto the glaze in gilt, blue, white, black, yellow, and red. Some examples are decorated with raised floral rosettes, cypress trees, crescents, blazons, and a variety of animal figures.